Thank you for all your research and taking time to help educate about the dangers of "following the crowd". Thank you and God Bless you for speaking so forcefully and eloquently about the dangers of the vaccine racket to all human health and freedom. The only good vaccine is one never taken according to Dr. Sherri Tenpenny whom I wholeheartedly agree with. Everyone should do more research on the so-called "good" vaccines, polio and smallpox who cause more death and injury than most vaccines. I feel the government should step in and take the vaccine requirements away. If they will not change. Then we should vote every one out of office. how would everyone fell if they were going loss their jobs in all government bring fear to them losing their jobs like they want us to take flu shot or lose our jobs to ever one should have a freedom Make sure we all get out and vote and make the vaccine be a part of voting we should be able to make our on choice. It is my privilege to report that I was associated with Dr. Robert Mendelsohn in Illinois when I lived there, and was involved with La Leche League. Glad to hear him referred to in this speech/article. He was one of the first voices that alerted me, as a young mother, that the hospitals were the new sanctuaries of worship. That today's doctors were the new priests. (I had just finished college and had completed requirements to become a Cytotechnologist and was now a new Mother). He and Dr.Herbert Ratner functioned on the Medical Board of La Leche League and often informed us of the truths about so-called modern medicine and the foibles in the same. I learned to ask questions, and ask them the right way. How to recognize so-called medical reports for the sales and marketing gimmicks they actuality are. Thank you for your 30 years of faithfulness. My 28 year old's friends are highly effected by vaccine propaganda and use fb as a soap box to mock their peers who choose to educate themselves on the dangers of vaccines. You provide a wonderful support system to new dads and moms that we didn't have 28years ago. I listened to your speech and with all the data it's surprising the pharm co's still wield so much intimidation and power. To all my friends who are read thru this information, We have many innocent children and a sister Kathy who have been inject to this deadly vaccine to damage her body completely disable for 12 years old until she finally pass away. My Father-in-Law and Mother doesn't know exactly what happen, why it happen, because they can not speak English, and believe that Doctor are Certify Pediatric, they must do the right thing. Until the day know it was completely too late. My Friend, Doctor is not God, they are another fucken human being like you and me. They don't care who will be suffer thru this type of Vaccine. Do they know? Of course they do know that this Vaccine have Mercury, and aluminum. Do they care? Nop. Money is what they care about. It's danger and damage your Child that you love the most, you suffer. We must protect and have the right to know. Stand up help us support this program, to know your right that God has given to each child born to be perfect, God given them their Destiny, not the Doctor. Let's each one of us Mother, Father, son, and daughter have the right. Let's fight this nonsense Vaccine. Thank you. May God Bless us all. I have lived with what SV40 does to a person since I received the Salk vaccine in 1962. I have been taking rna/dna herbals for 4yrs now and I'm getting better. Anyone trying to force me to get any other vaccinations will have to wait until I'm too old and frail to resist. Until then any would be injecters will be injected with lead! My two older children had all of the vaccines required until the age of five and three when I lost my job and my health benefits. My son always got very sick after any type of vaccine and usually ended up in the ER. His symptoms were not death-threatening. He is a very bright child (now 12), but has severe ADD and major sensitivities to gluten, dairy, MSG, barley, lactose, lactase, lactic acid (derived from dairy), and whey. There are no known autoimmune disorders in any family member known for four generations back. My now 10-year-old daughter had all her shots until she was three. She never had reactions to the shots except feeling "achy" for a few days following. However, she has had many, many health issues that are quote "unidentifiable" by every doctor and specialist she has ever seen from private practices to UC Davis to UC San Fransisco Children's Hospital to Loma Linda University Medical Center to the Shriners Hospital and many more. She has been submitted to just about every test there is in the medical field with no definitive results. She has had petite mal seizures, migraines, achy muscles, swollen joints, memory loss, fatigue, and so much more. All of these symptoms are due to "unknown reasons" by some of the very best doctors in California, Oregon, and Washington. My third child, now three, was given shots in the hospital before we came home after birth WITHOUT a my knowledge or permission. He had constant nose bleeds for 18 months. He is now 3 1/2 years old and has major speech issues. After years of studies, I firmly believe that my children's medical issues are a direct result of vaccinations. Many people ridicule me. How many people who have had not just one, but two and even three MMR shots have gotten the chickenpox? Almost everybody. People who believe in the vaccine say "but you didn't get a bad case of chickenpox like you would have without the vaccine." Not true. We have the scars to prove otherwise. Also, the MMR a vaccine sets our bodies up for future cases of shingles, again strongly related to vaccines. This is America. It is supposed to be a free country. Yet not only are our parental rights being stripped from us, but medical doctors are being forced to give vaccines or go find another job! I believe I have made my opinion clearly. Parents deserve the right to make choices for their children in the best interest of their children. Adults - 18 years or older? I say 16 years or older - should have their own right to be or not to be vaccinated while keeping their CONSTITUTIONAL RIGHTS to be educated and employed regardless of their decision. Incidentally, if people who advocate vaccines are so sure the vaccines work, why are they so worried about those who are not vaccinated? The answer to all these questions, arguments, can be summed up in two words: POWER and MONEY. 28 years ago my family was taken to court with no legal support and custudy of my children was threatened because I refused a tetanus shot for my daughter. An "anonomous" person had turned us in after my daughter fell on a garden rake, and I treated her wound as I always had (I am a nurse). She was forced to get a vaccination, even though the time was well passed that she would have tetanus as a result of the injury. The doctor (our doctor and friend) who testified had no idea what was going on- he just did what HE thought was right. It was a surreal and painful experience, and I pray for all those who are going though it now, and I pray this madness will end very soon. Vaccine safety cannot be adequately studied without knowing the ingredients in the vaccines. This is where the provax folks tell me that I cannot PROVE that vaccines have peanut oil and food protein in them. That is true. I can only show a great deal of circumstantial evidence that vaccinated people and animals have food allergies which are increasing and serious, but among unvaccinated people and animals food allergies are nearly unknown. I have shown the law about secrecy and self-affirmed vaccine ingredients. But it is not the job of the public to have to PROVE vaccine safety. It is the job of the FDA to "take action on particular substances if information is brought to their attention that causes them to doubt an ingredient’s safety." And it is the job of the pharmaceutical companies to prove safety. So I have done my part. Dear FDA, I am bringing it to your attention that the self-affirmed GRAS ingredients and culture mediums used are the direct cause of the food allergy epidemic among our children. Dear Pharmaceutical Companies, I am calling the public’s attention to the fact that you are keeping secrets. Secrets that can be harming our children. It is not perfect, but it doesn’t need to be. It is adequate to prove that there is a major problem with the vaccines. If you disagree with me, then you show the world that the pharmaceutical companies are disclosing all of the ingredients and that the vaccines don’t cause immune reactions = allergies. This is the important part: Under U.S. law, an excipient, unlike an active drug substance, has no regulatory status and may not be sold for use in food or approved drugs unless it can be qualified through one or more of the three U.S. Food and Drug Administration (FDA) approval mechanisms that are available for components used in food and/or finished new drug dosage forms. The FDA needs to improve its oversight of GRAS (generally recognized as safe) food ingredients, claims a new report from the Government Accountability Office (GAO). The Food and Drug Administration (FDA) no longer ‘approves’ food ingredients as GRAS, but does review their safety if a company submits a research dossier including the findings of an independent scientific panel. Following review, the FDA can issue a letter of no objection, leading to what is commonly referred to as FDA GRAS. However, the company remains responsible for ensuring the ingredient is safe and that it complies with all regulatory requirements. Alternatively, a company can self-affirm GRAS after conducting all necessary research and forming an independent panel to determine its safety. To self-affirm, the company needs to be confident that it could defend the safety of its ingredient based on this process. But the GAO said the FDA should be made more aware of self-affirmed GRAS products, and should systematically review the safety of current GRAS ingredients as new scientific data comes to light. “FDA is not systematically ensuring the continued safety of current GRAS substances,” the report said. “While, according to FDA regulations, the GRAS status of a substance must be reconsidered as new scientific information emerges, the agency has not systematically reconsidered GRAS substances since the 1980s.” FDA officials countered they are continuously reviewing the scientific literature and take action on particular substances if information is brought to their attention that causes them to doubt an ingredient’s safety. I was at OfficeMax in Sandusky, Ohio. A woman I knew a little worked there. Black woman. I was at the register. Her phone buzzed. She turned white as a sheet, looked at the phone, had a relieved look, then started to ring my items up. I had to ask her about the phone. She explained that her daughter is allergic to fish. If she even smells fish cooking, she needs to be taken to the hospital emergency room immediately or she could die. The school serve fish. She asked them not to but her daughter's life can't interfere with the school menu. I tried to imagine what it would be like to have a daughter allergic to fish in Sandusky, Ohio. It is right on Lake Erie. Everyone loves Lake Erie perch and most of the restaurants serve it. How can you drive down the street and have to be worried if someone is cooking fish? I later read about serious peanut allergies. There was a serious peanut allergy epidemic in the United Kingdom. Kids were allergic to peanuts just like my friend's daughter was allergic to fish. Just smelling cookies baking could kill. There was an article about a teenage girl. Her boyfriend kissed her after eating a peanut butter snack, and she died. How could this happen? These allergies were new. Allergies like these were extremely rare and were now becoming commonplace. What is going on? So I searched the Internet for clues. And I found the answer. I was so shocked that I was shaking. How could it be possible? But the more I searched, the more it became clearer and clearer. These allergies are directly caused by pharmaceuticals. Can I prove it? Well, I have no credentials. I'm just a mom and grandma. But I can read and write and think. And obvious is obvious. It doesn't take a doctorate degree to read and add up all the evidence. Food allergies are nearly unknown in 3rd world populations. The medical profession tries to explain this by saying it is because we are "too clean". Animals are not usually allergic to food, either. It is because they are too clean that our pets and zoo animals are getting food allergies, too? So how can you create a food allergy in an animal? It has been known since 1839 that injections of food protein can cause food allergies. Is there a connection between injections and food allergies? I searched patents for "peanut" and "vaccine". I found peanut oil listed in the patents. How can that be? Pharmaceutical companies can self-affirm Generally Recognized as Safe ingredients. This means they can use highly refined food oils as ingredients in vaccines and pharmaceuticals and it becomes a protected trade secret. Nobody is allowed to know what food oils might be in a vaccine. Nothing is even submitted to the government! Patents for vaccine carriers, adjuvants, and culture mediums list every food known to man. It is only the final culture medium that is listed on the package insert. The history of food allergies follows the history of vaccines and injections. Peanut oil and other highly refined oils can be ingredients in the vitamin K shot and vaccines which are given at birth (or prebirth, now that pregnant women are being heavily advised to get vaccinated). No wonder our children seem to be "born allergic"! Why don't all children become allergic after vaccinations? Vaccines are not identical at the molecular level. Even not shaking the vial can affect the mixture. Think of the food protein as marbles. There could be 6 marbles in a batch of 100 doses. One kid could get all 6 marbles or 6 children out of 100 could each get one. I found far too much evidence of food allergies in vaccinated populations but not in the unvaccinated. Did you know that some parents of kids with serious food allergies spend $10,000 for a dog that can sniff peanuts? There are stories of peanut allergic children dying because there was a trace amount of peanuts in a pizza. Peanuts are being banned from schools and day care centers. Children have to carry epipens everywhere they go. And just like my friend with the fish-allergic daughter, she lives in fear every day that she might lose her daughter. The government should take away the right of pharmaceutical companies to self-affirm GRAS ingredients and ALL ingredients should appear on the package insert of pharmaceuticals. Your doctor should know what he is injecting into our children. Please copy what I wrote and share my post. I am so thankful for the work you do and have done. I did not realize before that you were the co-author of "A Shot in the Dark". My granddaughter had a terrible reaction to a DPT shot when she was 4 years old. She had just come to live with me and did not have most of her baby shots. After the DPT shot I never allowed her to be vaccinated again. That was in 1989. Thank God about that time I read "A Shot in The Dark" and determined not to give in on vaccinations ever again. My granddaughter does not allow any of her children to have shots. Her pediatrician tried to give the last baby a HPB shot at the hospital but we both refused. I had been reading about HPB and questioned the pediatrician. She had to admit there was no way the baby would be infected with HPB. I am thankful that we still have the philosophical exemption in Colorado! Once when I went to a new doctor, his nurse came in with a tetanus shot for me. I refused. She had a fit and told me I would die a horrible painful death without the shot and stormed out of the room. Needless to say I found another doctor. Thank you for all your work. I am horrified at the prospect that people would be forced to be vaccinated. It borders on eugenics and is clearly a political move which has nothing to do with health. It is all about power and money like so much else in this world today. Unfortunately many doctors and nurses are brainwashed and not taught the true history of vaccines, among other things. The U.S. is no longer a free or democratic country. Instead it is run by greed and money, largely because of Citizen's United. What happened to humanity? Hi, I took my three children (ages 4months, 5, and 7)to receive their check-UPS last week and today I received a certified letter from their pediatrician stating that they will no longer be able to receive care due to the fact that they do not get immunizations! I am floored! It was also stated in the letter that they will recommend vaccinations and if I do not comply within six months, I must find another physician. We are located in Memphis, TN. What should I do??? And I pay for their health insurance! I would say that if there is a causal efefct of IQ -> disease, then improving health care will result in a lowered average IQ. The smarter people are preventing themselves from getting sick. If you ensure that those that get sick survive more then you are removing the selection against them and enabling the less intelligent people to survive.yes one could logically argue that disease -> IQ (but remember you don't study for an IQ test) but the notion that IQ is important to survival is unpalatable to society, (because of the social implications) yet we reward better performing workers with higher salaries.IQ has to be one of the most important measures of fitness we have even if it is can never be an exact measurement. What is important is that statistically it is unshakable. The government has NO right to force vaccines on people - period. The constitution gives rights to people, not governments, and the government's privileges are well defined as limitations. Plus, the feds have no rights on those in the states, except as defined as enclaves of the federal government. By the same token, states have no rights to force any substance into any human being. Are you kidding me? It's not about vaccines, it's about forcing people to take in substances into their bodies, violating the 4th amendment- "the right of the people to be secure in their persons, houses, papers, and effects, against unreasonable searches and seizures, shall not be violated, and no Warrants shall issue, but upon probable cause, supported by Oath or affirmation, and particularly . If they have the right to force any substance into the bodies of people in America, then they can force poisons, as well as vaccines, which some consider poison. Jim Jones didn't either. It's not rocket science and convoluted thinking and ideas don't grant rights where none exist. I thank those that are willing to take the time to teach others that our rights are being eroded by very large corporations. I go on record saying I am NOT against vaccinations that are CLEAN and PROVEN to not cause harm in any way, that are necessary for an individual's health, if THEY so agree. I am not in agreement with FORCED MEDICINE ON ANY UNITED STATES CITIZEN. I have been reading about the Healthy People 2020 Plan. "Healthy People provides science-based, 10-year national objectives for improving the health of Americans." I just have to wonder...is any of those "objectives" going to be forced? Say no to vaccines, (young and old alike...is that why ACA was so important?? To keep tabs?) and possibly lose driving privileges? Or, worse? Jail time? I see trouble ahead. Anyone know of a place one can live healthier without the gross intrusion of a mis-led government plan?? Please advise. Seems downright nazi around here anymore....just my opinion. Keep up the fight for our freedom to make these choices. When H1n1 came out the large hospital I work at made the vaccine mandatory. I fought for my right not to be vaccinated, had to explain my beliefs to a board of directors for the hospital. I was told I would loose my job, they use bullying tactics. I was told not to return to work until I could prove I was vaccinated. The next day I got a call that the hospital lawyers said I can keep my job. Since then, every year I have to submit a letter explaining my reason..which I have stated it is my religious belief to not put toxins into my blood stream. Now 10 years later I am facing the same threat over the Tdap vaccine which they decided to make mandatory this year. Once again I am fighting it and am told they are reviewing what impact it would have on the patient population if I am not vaccinated. Today is my official last day here after 17 years of employment, still waiting to here if I can return to work next week. Pray for their hearts to realize this is a freedom they should not jeopardise. Stand up for your beliefs. I am praying they rewrite their policy and fully prepared to stand up for myself. Yes, self-detrrmination. Yes, decisions based on accurate, valid, reliable science. No, your conclusions about the safety of immunizations are wrong. I'm a nurse with 47 years of experience and a PhD education. I wanted all of my grandchildren to be fully immunized based on science, despite annecdotes of idiosyncratic individual reactions. Based on current extant sciece, I think consent for immunization is the best decision for US families and for residents living in our nation. Please rethink a decision to refuse immunization. Well done. Good for you. I don’t know how many times this video has been viewed, but I’m shocked to see only 21 comments. I’ve recently begun looking into research and information in general on this subject. I’ve listened to many videos on the subject and I look forward to reading “A SHOT IN THE DARK” and Robert F Kennedy’s book, and others. 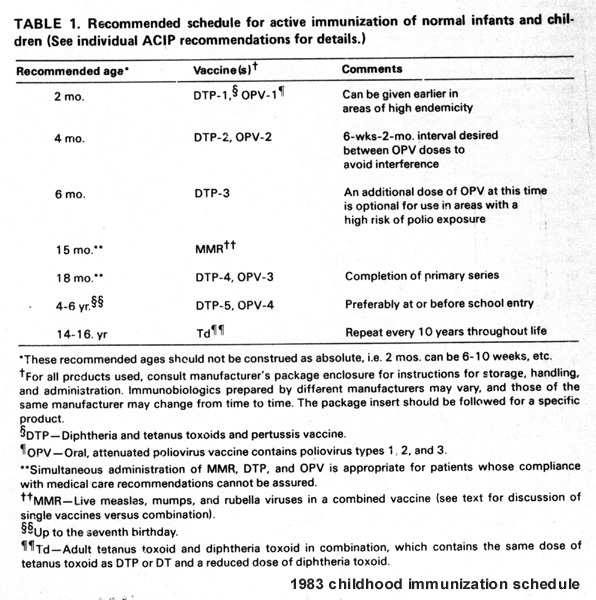 I never had children, but at this point, if I were a new parent, there is no way I would simply allow, without question the current recommended, prescribed and demanded schedule of vaccinations.